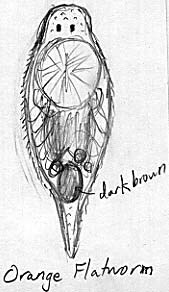 drawings by Brenna Lorenz This is a portrait of one of our larger flatworms. The dark brown object is probably an egg. The large, round thing below the eyespots is the pharynx. This little flatworm, with its bean-shaped eye-spots, huge mouth and bumpy skin, probably belongs to the same genus as the larger orange flatworm above. This flatworm has no obvious eyespots. The "eyes" in the picture are colorless, and are probably some sort of sensory pits. Although it is less obvious with this individual than with others I have seen, this worm probably consists of two individuals that have not separated from each other after asexual division. Something seemed to be sticking out of its side on the left, as shown in the picture. This individual is probably the same species as the one shown above, but in this case, the distinctiveness of the two segments was more pronounced. I could see two sets of sensory pits and two mouths. This is one of our smaller flatworms. Here is the companionable flatworm, that never strayed far from the company of another of its species in the slide. It has no eyespots. 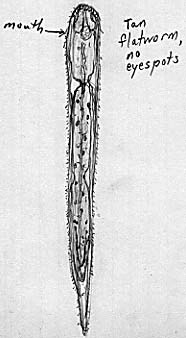 The cilia on this one were particularly easy to see. Some of these get very large. This beautiful, shaggy, slow-moving flatworm is uncommon in our sample; we have only seen two of them. I think it's a rhabdocoel, meaning that it has a simple, undivided sack-like gut. It has attractive eye-spots. Return to Microscopic Critters of Guam.